There are several popular science curriculum available to homeschool families entering the high school years. The challenge is that they are written with the student on a college-prep track in mind . What if your child is focusing more on pursuing a trade or entering the workforce after graduation? When we heard about Fascinating Education’s courses in Chemistry, Biology, and Physics that were designed for right brain learners we were intrigued. 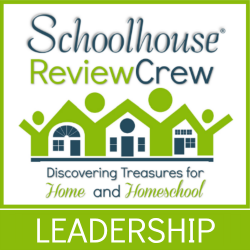 During the last month, we have had the opportunity to use Fascinating Biology and are providing this review from the perspective of homeschooling a high school student that will more than likely not pursue a college education post graduation. The Fascinating Biology course is actually the second course in the Fascinating Education series. Dr. Margulies, the creator of the curriculum, is also a neurologist. He has combined this knowledge set of how the brain processes information for learning as well as the fundamentals of science to develop a curriculum specifically with right brain learners and visual learners in mind. Being a scientist, he realizes that the basis of all life is found in Chemistry. For this reason, the instructional path within Fascinating Education is Chemistry, Biology, and then Physics. There is a brief Chemistry subset of lessons that can be added on at the beginning of the Biology course for those that are starting with Biology prior to taking Chemistry. Fascinating Biology is a full non-lab science high school course. It can also be completed by upper level middle school students. When considering the use of this course for middle school students, it is recommended to first use the Chemistry course. According to the vendor’s website, the course can be completed in 30 hours. Personally, our family found this to be a stretch and could easily see it expanded over a full school year especially if some lab instruction were added. Given the content in the course, the actual time it took to complete lessons, and in focusing on using this with our general high school student, I would consider this course to be equivalent of a full high school credit. This course is an on-line resource. The lessons are a series of slideshows that are very graphical in nature. A full script of the video presentations is available for download or printing. There is also a end of unit test available both through the on-line module or as a pdf download. The cost of a full year of access to the Fascinating Biology course is $79. We were using this course with our high school freshman. I was somewhat alarmed at first when I saw that it was only 19 lessons and still considered a full year course. After exploring, I realized that the creator of the curriculum was using lesson for what I would consider a unit or chapter. The first step we took was in printing off the script for the lesson/chapter. This is the word for word script for all the teaching that is shared in the video slideshows. These printed scripts were put into our son’s three-ring binder and he was set off with a pencil and highlighter in hand. 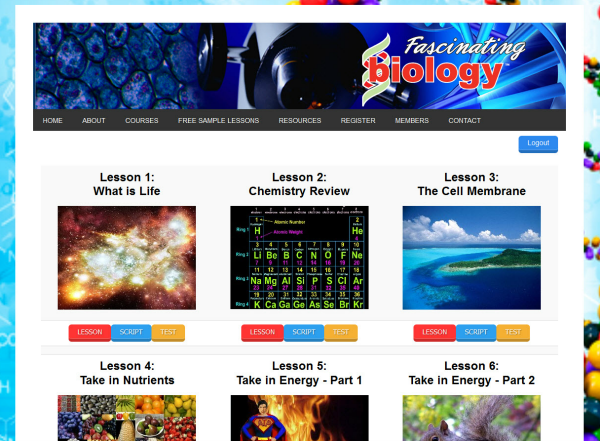 Main screen when entering the Fascinating Biology course on-line. Note the three buttons under each lesson for lesson, script, and test. Each day, he was assigned a certain number of slides. We reviewed how to pick out important details and effective note-taking. As he watched the video presentations, the pause button was used frequently so he could stop the video while he hightlighted, jotted down his own notes, or sought out further explanation from me on something he did not understand. He generally did not have many questions and was able to narrate back to me at the end of the day’s work the things he had learned. We would spend a few days reviewing the lesson/chapter prior to taking the test. There was a significant volume of content in each lesson. This was definitely not a watered-down science course filled with fluff. Real learning was happening daily. I encourage you to visit the product page for Fascinating Biology for a complete list of the topics covered as well as the opportunity to view a sample lesson as your child would if using this curriculum. I really think that Dr. Margulies is on the right track in providing a curriculum for right brain learners and those looking for solid science instruction in high school that does not necessarily include all of the rigor of some college prep curriculum. This is a great resource to fill in the gap for those that want strong core science courses for their general high school student. The curriculum would also be wonderful for middle school students that want a rigorous high school training to use as a precursor for more advanced studies later. My son seemed to really enjoy the format of the lessons. As a right brain learner, he really responded to the visual slideshow format. In having previously struggled with dyslexia, the ability to highlight the script and take brief notes was a winner as well. Adding a copy of the slide to the script for that slide. This would help with the visual recognition and association that helps to bring the right and left brain functions together further. Integrate some “daily work” or questions at the end of the lesson in a similar format as the on-line tests that would help to reinforce the key things covered in the slides. Add an optional experiment track on to the curriculum to bring in kinesthetic learning to really hit as many senses as possible for students that need this fully integrated learning approach. All in all, I love knowing that I now have an option for my students that may not be pursuing a rigorous college-prep track. However, I do see that with the addition of some projects and labs, this too could be a wonderful curriculum for those planning on pursuing post-secondary education that are right brain learners. As Christians, our family generally tries to use science curriculum that is written from a Creation, Young Earth perspective. The Fascinating Education materials are not written from this worldview, but I also did not feel that there was any strong indoctrination into an Evolution worldview either. This was really not a big issue for our family in using the Fascinating Education materials. As always, I encourage you to see what our other members of the Review Crew had to share after using Fascinating Biology as well as Fascinating Chemistry and Fascinating Physics. Click on the graphic below to check out these reviews.